The signing deadline for this year’s draft class has passed, and just four players from the top 10 rounds failed to come to terms with their drafting team. This was slightly higher than the previous couple of seasons, but interesting this year because all four non-signing players were basically the same situation: high-end 1st round prep players with big price tags who in the end each turned down at least $2M each (and in some cases a ton more) to go off to school and lock themselves in for 3 years of playing for unaccountable, arm shredding, self-interested NCAA coaches who often could care less about player development and more about their next conference title and regional hosting bid. And each of them probably made a huge mistake. Its a common refrain among pundits in the amateur baseball world (Keith Law in particular) that HS players should “take the money” if they’re drafted high enough. Certainly any first rounder would be a fool to turn away that kind of money, and mostly any prep player offered something in the upper 6 figure range should give serious consideration. MLB contracts generally include college tuition … so even if you sign out of HS you still have 4 years fully paid for in case you wash out. So instead of gambling on your health, or the fickleness of the baseball draft (where one bad start can cost you 30 spots in the draft and millions of dollars), take the cash when its offered. But, don’t take our word for it. Lets look at the empirical evidence of every player over the past seven drafts who has forgone the cash to see if there’s any trends. Here’s a summary of the last few years of players who did not sign from the top 10 rounds. This only goes back to 2012, since that’s the beginning of the new draft rules. 2014: 6 (two of which were Nats picks: Andrew Suarez and Austin Byler in that ill-fated draft class, and one more who didn’t sign thanks to Houston’s screwing up the Brady Aiken deal and who was eventually granted free agency). These are the total non-signings for the top ten ROUNDS of draftees, meaning anywhere between 300 and 350 guys comprising the top 10 rounds and supplementals. So in the seven years and roughly 2200 players drafted in the top 10 rounds in the last 7 seasons, a grand total of 37 have failed to sign. Side note: each year we hear about all these players who aren’t going to sign or that negotiations are tough, when in reality the modern CBA rules nearly guarantee 100% signing among drafted players (unless there’s a huge misunderstanding on draft day, or a huge disagreement about medicals). The draft pools are structured so that the penalties for NOT signing players can cascade and affect your ability to sign other players (see Houston’s issue in the 2014 draft), so teams are now basically calling players in advance and saying, “If we draft you at X, will you sign for $Y?” … so the only reason players don’t sign is if there’s a serious breakdown or mis-understanding. So, why do i say that you should always take the money? Well, lets ask ourselves: out of these 37 players who didn’t sign.. who actually IMPROVED their draft status by not signing? Lets go year by year and look at the players who failed to sign. (a caveat here: I did not look at the dollar amounts offered here; this is basically draft round analysis. Its possible that a 5th rounder in one year went in the 8th the next and got offered more money … but its quite rare with the new draft rules and bonus pools. Everything changed with the new CBA that went into effect in 2012. The Nats in particular spent $14.6M on draft bonuses in 2011. The next year? $4.6M, with most of it going to one player in Lucas Giolito). 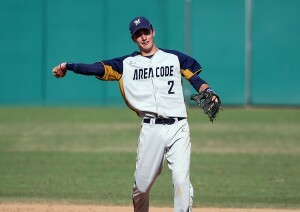 Matt McLean: 2B Calif HS. 1st/25: Asked $3M, Arizona offered $2.6M didn’t budge, going to UCLA. Gunnar Hoglund: LHP Fla HS. 1supp/36: Pittsburgh didn’t like physical, low-balled and he declined. going to Ole Miss. Obviously its too early for these four players … but all four turned down significant dollars being 1st rounders, and the odds of them improving their bonus amount and/or their draft value (especially Stewart) seems slim. Why? Keep on reading. Its clear though that Mississippi State is going to be STACKED for the next few years though … they’re getting two first rounders to school and into their rotation. Phew; good luck to the SEC running up against this rotation for the next three years. That just doesn’t happen very often. Verdict: 4 too early to tell. Two players too early to tell. Rasmussen didn’t turn down the Rays as much as they refused to tender him a contract … they must have tendered him something because they got a comp pick in 2018 draft. So he turned down 40% of first round money in 2017 to sign an underslot deal in the 6th round of 2018 ($135k, just $10k more than the non-top 10 rounds minimum). I’d say this was a bad move by the player unless Tampa flat out refused to pay a dollar. Verdict: 2 too early, 1 worsened his draft position. One guy still too early to tell, but its fair to say that Lodolo is probably pitching his way into the upper 1st round in 2019. So he’s trending on improving his stock… as long as he doesn’t destroy his arm in the shredder-program at TCU (thought to be fair the notorious coaches who destroyed more than a few arms there, including a Nats pick in Matt Purke, have moved on). Meanwhile Buffett improved his draft position one round by going back to school. Verdict: 1 trending good, 1 improved his draft position one round. 2015: 6 guys did not sign. 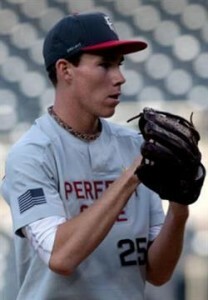 Kyle Funkhouser: 1st/35th overall: RHP from Louisville, failed to sign with LA Dodgers, turning down an above-slot $2M. 4th rounder in 2016, signed with Detroit. Nicholas Shumpert, 7th/220th overall. SS Colorado HS. failed to sign with Detroit. Went to San Jacinto CC, drafted in 28th round 2016 by Atlanta and signed. Kep Brown, 10th/311 overall. RF South Carolina HS, failed to sign with LA Dodgers. went to Juco, then to UNC-Wilmington, not drafted in 2018. Funkhouser was the biggest “whoops” here; a poor spring took him from his pre-season top 10 draft position all the way out of the first round, but he still demanded upper 1st round money. He didn’t get it … and then fell to the 4th round the next year. That was a big fail. Singer clearly improved on his 2nd round status by going to college. Cody slipped from being a 2nd rounder to a 6th rounder. The other three guys drastically fell on draft boards; one of them going from a 10th rounder to not even being drafted. 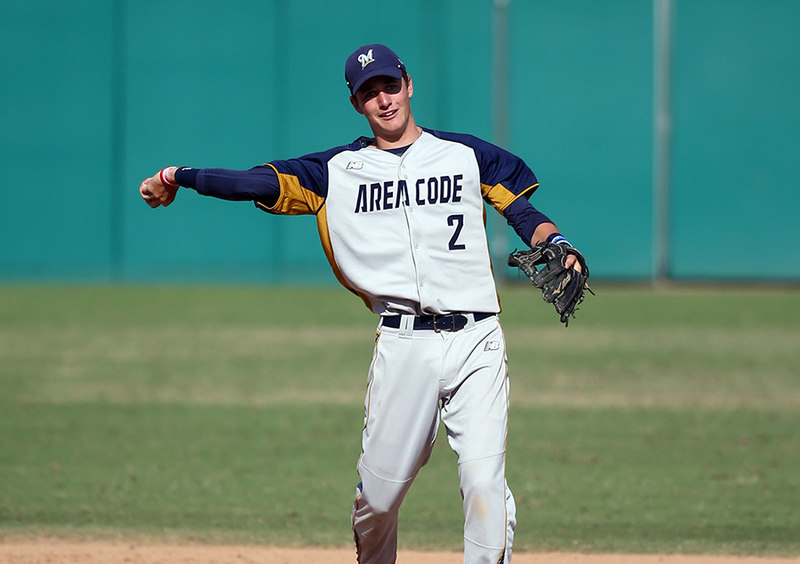 Aiken became quite the rarity; the first #1 overall baseball pick to fail to sign in 30 years. But his lack of signing cascaded and cost the Astros both their 5th rounder Nix and another player later on thanks to the new draft rules on bonus pools; Nix ended up being declared a FA in a face-saving move by MLB so as not to admit that their new bonus cap circumvention rules were BS. Aiken had no where to go but down from 1-1 so he obviously cost himself money. The others all fell, if only slightly in Suarez’s case. Phil Bickford: 1/10 RHP California HS. Toronto failed to sign. went to Southern Nevada juco, drafted 1/18 by SF and signed. Bickford fell 8 slots year over year but still fell. DeMuth and Kivett both improved their stock. The rest fell, drastically in some cases. Kyle Twomey, 3/106 LHP Calif HS Oakland. Drafted 13th round 3 yrs later out of USC by Chicago Cubs. Appel managed to improve from 8th overall to 1st overall. Stankiewicz also improved his stock about a round’s worth. Mazzilli improved from a 9th rounder to a 4th rounder. The others all fell. Verdict: 3 up, 5 down. So there you have it. 7 of 37 turned down money and look like they slightly made out (19%). 22/37 (60%) did not … and in some cases clearly cost themselves millions of dollars. And even those 7 who did improve their ranking … not one of them in my opinion drastically improved their stock by going to college. In fact, you can make the argument that getting drafted in the 8th round in one year, playing another year in college and then going in the 5th round probably *hurts* a player’s pro prospects because now he’s a year older versus his peers and has lost a year of pro development time. A 22 yr old college senior draftee is already “old for the level” until he gets to at least Low-A, which is no guarantee even in his second pro year. Now, has it ever worked out for a player to turn down significant 1st round money? Yeah a couple times; Mark Appel gambled and improved his stock just before the new CBA took hold; in fact he managed to go 1-1 despite being a college senior with zero leverage. Garrett Cole also made out by going to school. So did a few others in the pre-2012 CBA eras. But its a rarity; I’ve got another post that goes over these and some of the biggest nightmares for a later date. 2017 CWS Finals: Florida finally Wins! Here’s how I thought the pitching matchups would go; turns out LSU pushed both Poche and Lange to go with a “bullpen” game 1, starting a guy in Russell Reynolds who had a 8.50 ERA on the season in a gambit to get the pitching matchup advantages (and to get both Poche and Lange with more rest) for games 2 and 3. Risky; if Poche gets beat in game two then you lose the CWS finals with your ace on the bench. Meanwhile, Florida changed things up too, going with middle reliever Tyler Dyson in game 2 instead of Kower on short rest. Game 1: Monday 6/26/17: LSU middle reliever Russell Reynolds/bullpen vs Florida’s #2 starter Brady Singer (8-5, 3.18 ERA) on 5 days rest. Game 2: Tuesday 6/27/17: LSU’s #2 Starter Jared Poche (12-3, 3.33 ERA on the season) with 5 days rest vs Tyler Dyson (4-0 with a 3.23 ERA) with plenty of rest since he only has 2 starts on the year. Game 3 (if necessary): Wednesday 6/28/17: LSU’s #1 Starter Alex Lange (10-5, 2.97 ERA) with 4 days rest vs Florida’s #3 starter Jackson Kower (12-1, 4.15 ERA) on 4 days rest/#1 Alex Faedo (9-2, 2.26 ERA) on 3 days rest. In Game 1, Singer bent but did not break, giving up 3 runs in 7 IP and striking out a CWS record 12 guys before handing off to Florida’s all-american closer Michael Byrne for a 2-inning save to close out game 1 win 4-3. LSU’s Reynolds gave up 3 runs in 3 1/3 innings before handing off to middle reliever Nick Bush for the middle third and then deposed closer Hunter Newman for the final 2 and 1/3, and Bush/Newman kept it close but LSU just couldn’t score late to tie it. As mentioned above, an interesting gambit by LSU’s coaching staff going with a bullpen game against Florida’s best remaining arm. Lets see if Poche and Lange can pull it off in games 2 and three. In Game 2, Florida rolled the dice by starting Dyson, who gave them a fantastic 6ip 3hit, 1run outing while Florida put a couple of runs on Poche. LSU thought they had the game tied in the 7th when they scored a run on a double play ball, but an ill-advised slide caused the runner to be returned to third and LSU couldn’t capitalize the rest of the night. LSU’s closer Hess finally ran out of gas, giving up 4 runs in the 8th inning to put the game out of reach. Meanwhile, Florida’s coach tempted fate by bringing in his game 3 starter Kower to relieve his closer, a move that paid off as Kower shut down LSU to finish off the game and the win 6-1. Commentary: I think the right team won, and the team I predicted would win ended up winning … but neither Lange nor Faedo pitched in the final series. Why not put a day or two in there so that the pitching can work its way out and we could get a for-real three game series between these teams? That was the only downside of this final. 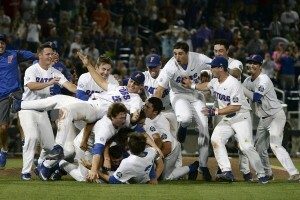 Florida’s long storied baseball program finally gets a national title. This concludes the College Baseball season and our coverage of it for 2017. I’ll post one more post that covers draftees and signing status for all local-connected players (prep and college). I don’t really cover the summer collegiate wood bat leagues: for that I’d suggest NovaBaseball.com, which is really coming into its own in terms of local coverage for all players with local ties. My pre-CWS predictions were LSU from the top and TCU from the bottom. My predictions weren’t looking too hot after the first day, but ended up being half right. Read on. In the opening games, Oregon State overcame a bad outing from Jake Thompson, rallying to top Cal-State Fullerton 6-5. Meanwhile, LSU similarly overcame a bad outing from its ace Alex Lange, getting a shutdown relief effort from #2 starter Jared Poche and the one-out close-out from Virginia native Zach Hess to beat Florida State 5-4. In the first elimination game, Florida State took advantage of 8 CS-F walks to win 6-4 and eliminate the Titans. In the winner’s bracket game, Oregon State made a pretty large statement by destroying LSU 13-1. OSU’s Bryan Fehmel totally baffled LSU for 8 innings, giving up just 1 run on 2 hits (the run was on a very large homer in the 8th inning when the game was well in hand). LSU’s staff walked *twelve* batters and never had a chance. In the play-in game to the group final, LSU’s Poche came back on short rest and dominated FSU for 8 innings, giving up just one unearned run. After back-to-back crushed homers to open the 9th, Lynchburg’s Hess came on and just blew away three hitters to close out the game with 95-96 heat and a fantastic curve. LSU moves on. In the group final, OSU could do nothing with LSU’s ace Lange, who gave up just two hits through 7 and a third; then super closer Hess came on and struck out 4 of the 5 guys he faced to force a winner-take-all game to close out the group. Its only fitting. I’m not the only one gushing over Hess; the CWS broadcasters spent a full inning talking about him … in the TCU/Florida game. In the winner take all game on 6/24/17, LSU got to OSU’s starter early, their own starter was fantastic (mid-week starter Caleb Gilbert gave up just 2 hits through 7 and change before handing the ball over to Hess once again. LSU comes back through the loser’s bracket to advance. 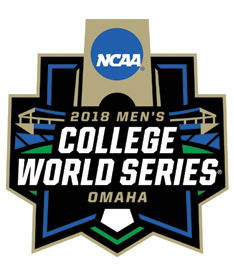 Its hard not to say that the loss of OSU’s ace Luke Heimlich didn’t affect the outcome of this CWS: I have no issues saying that LSU would have been much harder pressed to overcome OSU two days in a row if they had to face a guy with a 0.76 ERA on the season. Final Group standings: LSU, Oregon State, Florida State, Cal-State Fullerton. In the opening games, Louisville overcame a bad start from its #1 draft pick Brendan McCay to bash their way to victory over TAMU 8-4. In the nightcap, Florida rode a fantastic outing from its 1st rounder Alex Faedo, who shut down TCU on 2 hits over 7 innings for a 3-0 victory, severely dampening TCU’s chances and my predictions. In the first elimination game, TCU got a stellar start from Brian Howard (12ks in 7 innings) and eliminated TAMU 4-1. In the winner’s bracket game, Florida got a dominant start from its #2 starter (and likely 2018 early 1st rounder Brady Singer), who gave up just one run in 7 innings and Florida eased by Louisville 5-1. In the play-in game to the group final, two of the best teams all year in Louisville and TCU met in a loser-goes-home game. TCU got 4 runs early on Louisville’s #3 starter and their freshman ace Nick Lodolo combined forces with Sean Wymer to make it stick. In the group final, TCU broke out against Florida’s bullpen and won a laugher 9-2 to force the winner-take-all game. Again, only fitting given the talent that is in this CWS. However, in the final game, Florida’s Faedo shut down TCU and Florida got just enough against TCU’s Jared Janczak to advance. Florida to the CWS final. Game 1: Monday 6/26/17: LSU’s #2 Starter Jared Poche (12-3, 3.33 ERA on the season) with 4 days rest vs Florida’s #2 starter Brady Singer (8-5, 3.18 ERA) on 5 days rest. Game 2: Tuesday 6/27/17: LSU’s #1 Starter Alex Lange (10-5, 2.97 ERA) with 3 days rest vs Florida’s #3 starter Jackson Kower (12-1, 4.15 ERA) on 3 days rest. Game 3: Wednesday 6/28/17: LSU’s mid-week starter Caleb Gilbert (7-1 with a 2.85 ERA) with 3 days rest vs Florida’s #1 Alex Faedo (9-2, 2.26 ERA) on 3 days rest. 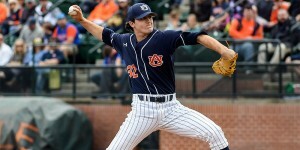 LSU’s missing their #2 starter (Eric Walker), who left the 2nd game of the CWS early and has not returned. This puts them in a bind, having to use both Lange and Gilbert on short rest. If Walker could return, they’d likely go Poche-Walker-Lange in that order. But, Gilbert was awesome in the OSU elimination game, so its not a big step down. Meanwhile, Florida burned Faedo to get to the final, and they may struggle to cobble together enough pitching to last the final. Singer is ready to go game one and will be a tough out, but Kower isn’t going to slow LSU’s bats, so it may come down to how far they push Faedo on 3 days rest and after throwing a 113 pitch gem in the group final. These teams met in March at Florida, with the Gators winning Faedo and Singer’s starts before LSU battering Kower to take the Sunday finale. I see the same pattern here: I think Singer shuts down LSU in game one, Lange does likewise in game 2 while LSU batters Kower again, leading to a distinct pitching advantage in game three.